While PDFs may provide data security, it isn't always easy or convenient to edit and manage PDF files. Often, if you are dealing with a document that includes many numbers and equations, those PDF files will need to be converted to a more editable format like Excel to properly work with the data. However, there aren't a ton of options out there to convert PDF to Excel on Mac. Luckily, this article will highlight the best PDF to Excel converter tools for mac, including PDFelement for Mac. Install and open PDFelement. Click on the "Open File" button. If your PDF document is an encrypted file, you will be asked to enter the correct password to unlock it after loading it in PDFelement. Once your PDF file is open. You can click on the "Convert" button on the top menu bar. As soon as you click the button, a submenu will be expanded. Choose "To Excel" to activate the conversion window. 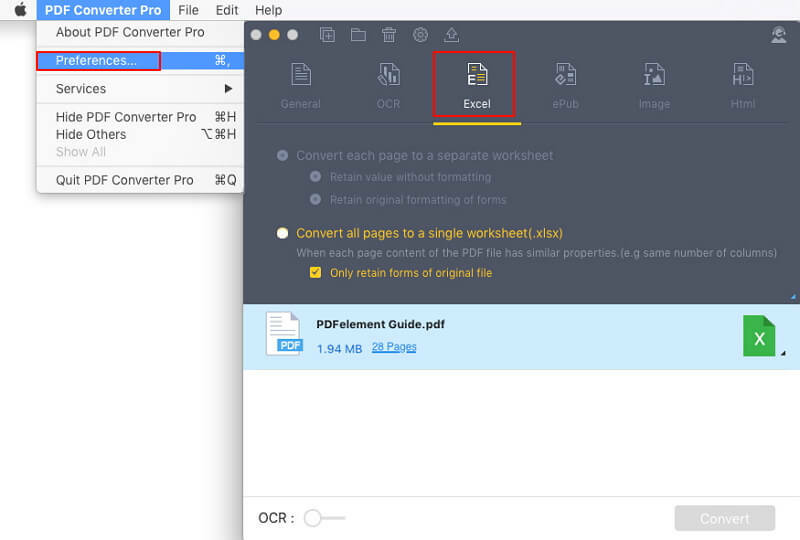 If you want to edit the PDF content before converting, click here to learn more about how to edit PDFs on Mac. 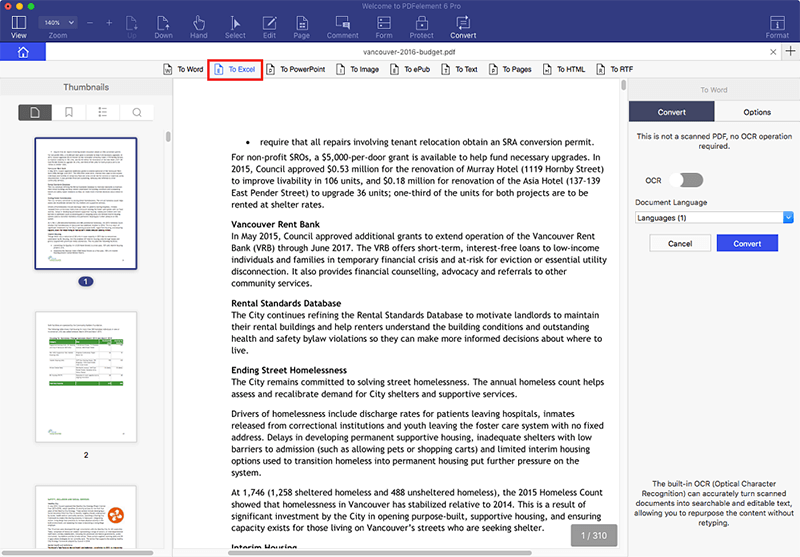 In the pop-up window you can select the page range and enable OCR for scanned PDFs. 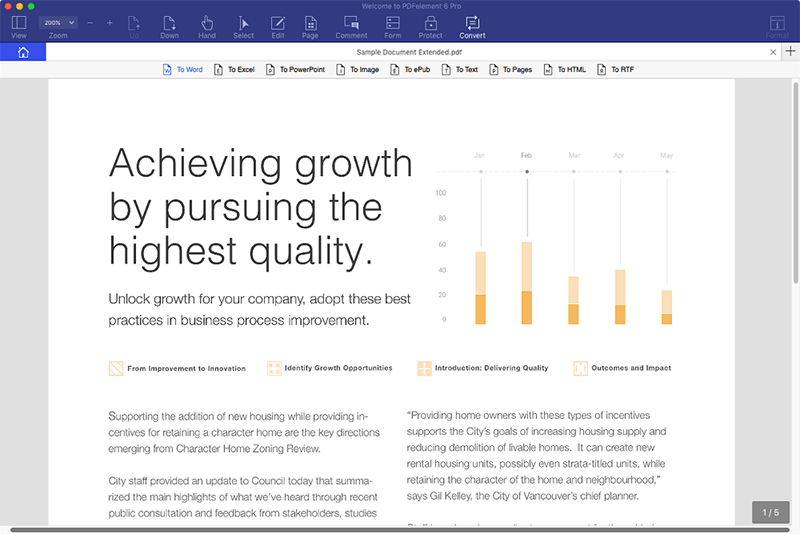 You can also choose to retain the original formatting or combine multiple pages into a single excel spreadsheet. Click "Convert" to begin the process. The conversion will be complete in just a few seconds. Another choice for PDF to Excel Converter tools on Mac is PDF Converter Pro for Mac. This professional converter lets you convert PDF files to various other format files as well. 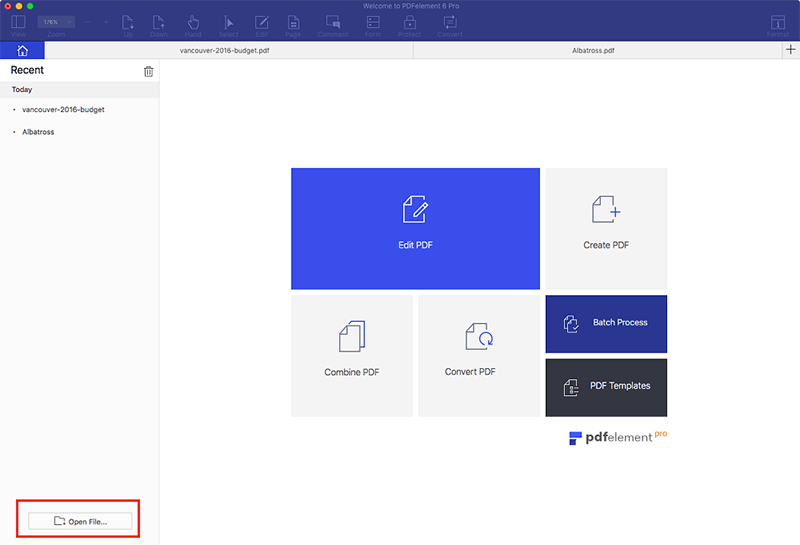 Drop and drop your PDF document into the program to open it. Click the "W" icon to select Excel as the output format. Click "PDF Converter Pro">"Preferences" on the top menu. In the "Excel" tab, you can access settings to convert each page into a separate sheet or convert all pages into one sheet. If you are looking for a hassle-free PDF to excel converter on Mac, the best option on the market is currently PDFelement for Mac. It retains the original formatting without compromising alignment, and can convert multiple pages at once. The OCR capability lets you convert even scanned PDF documents to excel. The most easy-to-use interface for mac users! It won't take you long to learn how to use the program well. 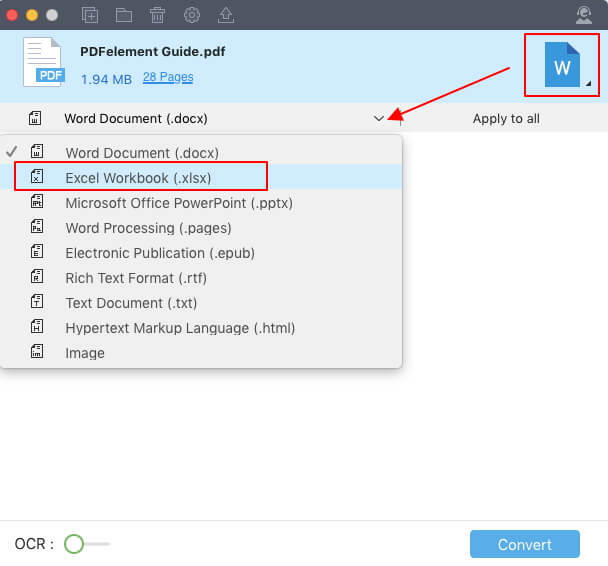 The most cost-effective PDF solution for Mac! Compared to many PDF solutions for mac users, PDFelement for Mac has all the features but at a much lower price. The button have a professional in macOS X! All the buttons are designed according to the habits of mac users. The most effective conversion on Mac! Convert PDF to Excel, Word, PPT, TEXT, Images etc. The OCR technology is embedded in the Pro version! You can turn scanned images and PDFs into searchable and editable text. In the fast-paced world, it's important that we make efficient use of our time. Manually entering data is outdated. Now we can digitally convert files to the required formats and manage them. There are several reasons why you might need to convert PDF to excel. No matter the industry you work in, you will likely be dealing with numbers at some point, and you'll likely need to edit or convert them as required. Most financial statements and documents are shared in PDF format for security reasons. However, we often need them in an editable format to accurately analyze the data. Whether it's a complex calculation of your yearly taxes or a simple personal budget preparation, it is easier to do in Excel since it has all the right calculation tools. While Excel is the most favored tool for any document involving numbers and calculations, PDF is the best format when it comes to security. With PDFelement for Mac, you eliminate manual data entry work, and save a lot of time and hassle with this Mac PDF to excel converter.